Once upon a time, ten-foot-tall carnivorous “terror birds” roamed the earth. In a paper published this week in the Journal of Vertebrate Paleontology, scientists revealed fascinating new details about their anatomy and hunting technique, based on studies of a nearly-complete fossil found in 2010. Laura Geggel reports in LiveScience that the researchers, led by Federico Degrange, learned a great deal about the behavior and anatomy of terror birds by studying the skeleton of Llallawavis scagliai. The researchers also discovered that the bird’s skull is more rigid than in other species, suggesting that Llallawavis scagliai may have killed by slamming its large beak up and down upon its prey. Geggel’s article and the paper itself have many more fascinating details. But I think we’ll just leave it at that because we’re frightening the cat. 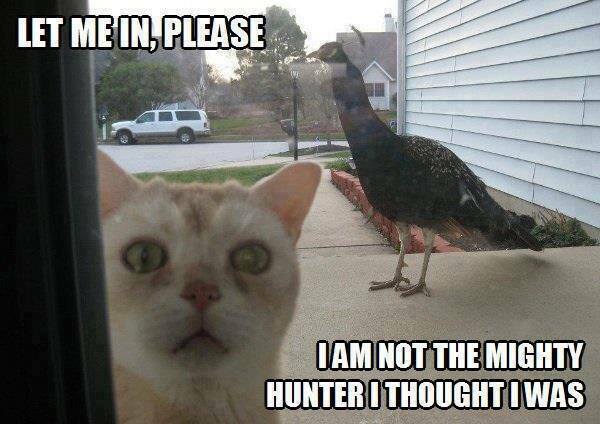 This entry was posted in Science Caturday and tagged dinosaur cat, lolcat science, paleo cat, terror bird. Bookmark the permalink.